Just Add a fab colour challenge! Just Add Ink have a funky colour challenge for you to sink your teeth into this week… Check it out! I had fun inking up my new Long Fellows hostess set – isn’t this wee turtle gorgeous? I am experimenting with groupings of elements lately – a card making style that appears throughout the new Idea Book and Catalogue for Stampin’ Up! 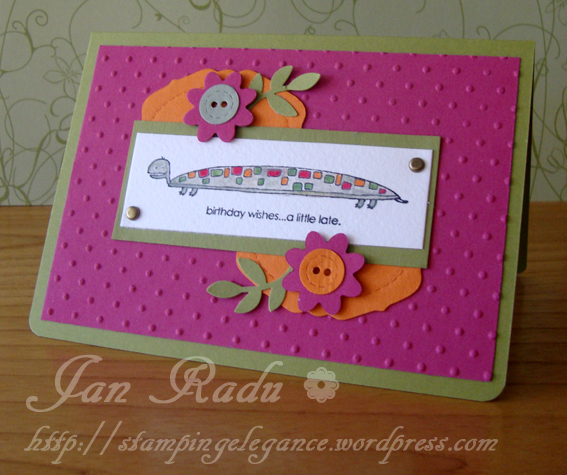 I have used a variety of bigshot dies and punches for the flowers, buttons and tags on this card. Now head on over to JAI and check out the great projects the DT have on offer for your inspiration! What a great example to show off the Big Shot. Love all the elements you have used Jan. This is so funky! Love the turtle’s spots!